Grundfos is one of the worlds leading suppliers of pump technology, and therefore has a major influence on the levels of manufacturing standards and operating efficiency that can be achieved with pumps.These provide customers with efficient, reliable solutions throughout the entire spectrum of heating and air-conditioning systems, and in the transfer of fluids used in industrial processes. Energy costs represent a major component of an in-line pumps Life Cycle Costs. 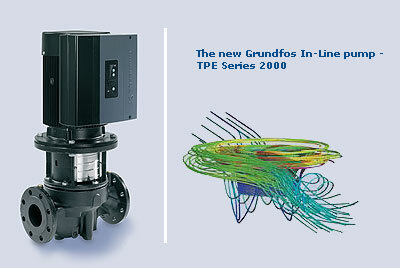 The Grundfos E-Circulator provides the best possible opportunities for implementing electronic speed control, which keeps the energy consumption of TP pumps to an absolute minimum. The kind of key technical improvements that are only available from a company like Grundfos, with a specialist staff of 450 people working solely on R&D and product development, means reliability and efficiency that set new standards for in-line pumps.